Climb to the platform to sneak into the stables in Payback in Witcher 3 Wild Hunt. Climb up to the roof and go through the door. Climb down the ladder and pick up the key next to the sleeping guard. 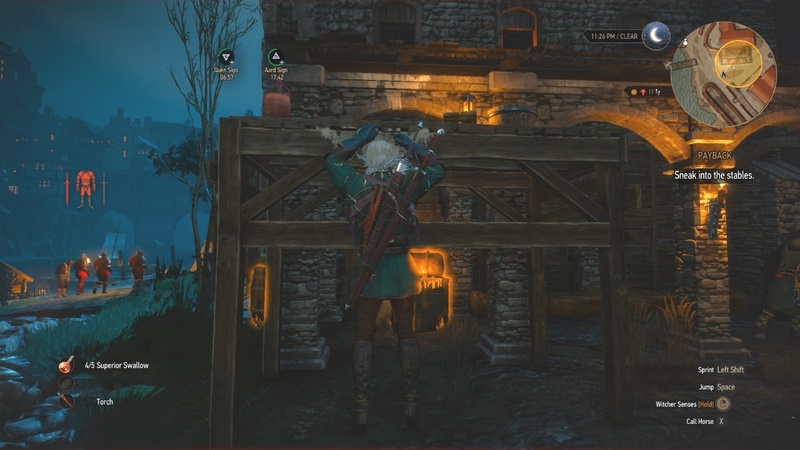 Use the key to let Ciri in. This entry was posted in The Witcher 3 and tagged Find Next Passage, Find Portal, Frozen, Frozen Village, Next Portal, The Witcher 3, Throughout Time and Space, Village, Wild Hunt, Witcher 3. Bookmark the permalink.